Here are my guys! Dusty? What do you mean dusty? I painted them.... Okay, I'll fresh them up a bit! "Bah Humbug ! Here I thought one Traffic Cop with Whistle! And 6.000 Japanese soldiers on Racing Bikes by Hat,might well do for this years Group build." " Well you sure got it wrong this time BB!" " He-He! BB,speed painted e`m too!" "O`, dear,6.000 in 28 minutes of paint dunking was good for our bb." " Never mind practice makes perfect!" " It`s only £23.00 for another Tin , So I`ll Dunk These Next." " Carlos how about that,A Bouncing Space Parade?" " And Black Visors too!" "Gunnars already painted his." They all announced.
" Bah Hum-Bug! Inside Info from Peter and Jan." _____ "EH! "___ " That`s not Fair!" " Never mind I can hear Quick Marching Crunching 15 inch Size Boots!" That looks really good guys. Kick off the dust and let them appear in a fresh painted uniform to be the hero of King Karl XII. And Paul, I wish that you continue this story. BTW: The CS Infantry was just an example. 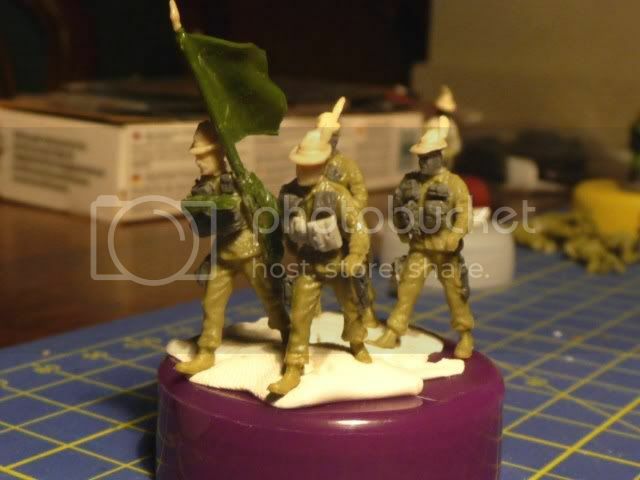 I would like to paint other units for the GB. But this was my last work so I had it in the bucket. Don't worry Paul. These were painted for a competition many years back. They lost and definitely need a freshing up! I resume this old job, hoping to finish it! Hi,guys,I had a word with General Mike Rose,and he helped out with classified info,that some of the Fiddle Wood Foot & Mouth Grenadier Lt Company`s were on Ops and it seems ADM, has commondeered their landing craft in the Midle East to do a spot of Fishing with President Trump. Learning from their SAS training to be resourceful they have turned their Sentry boxes into speed boats,and plan to board and evict ADM,and others off their Landing Craft and take it back. "TRUMP! Or No TRUMP! In he goes feet or head first,followed a close second by ADM! " BB,is wearing a Wooly Brown Hat, and has Sticky Wet Chocolate Powder smeared all over his face and he`s on the phone to Mike Rose General Commanding! "BB,likes to get into character,it brings memories back." It`s not good news,there seems to be problems with the newly selected special boat squadron of `The Fiddle Wood Foot & Mouth`,getting the make shift elastic band motor running freely into action. " They just ain`t moving!" " Oh! No!Becalmed ! "____________ " And there`s TRUMP & ADM,drinking all the British Booze aboard,while others are baiting their fishing-hooks for them." "What? Get E`m Off BB." Their army training kicks in,as they put their size 15 inch boots to those make shift motors.....and the elastic bands started into unwinding action,and as you see they are making good headway at last.
" go get that boat please?" said the timid tiny button.
" YIPEEEEEE! Go get that Landing Craft?" "It was very dark as night had fallen across that part of the Med,and it seemed like moving silver in the moon light.......As the Landing Craft was boared in complete Pirate Surprise! The Battle Cry.` Up The Fiddle Wood Foot & Mouth!' Was Yelled Out.Followed by a Sudden Scuffle! Followed by two Huge Thundering Splashes as TRUMP & ADM went Head over Heels,into the Drink. " "Questions are now being asked why did these two cry out in Russian, to be saved? " those pictures are looking very promising. I really like the Alpinis. And I am happy that you are in Mai Strac. Very impressive conversions. Your unit is as perfect for the GB as Gunnars troops are. 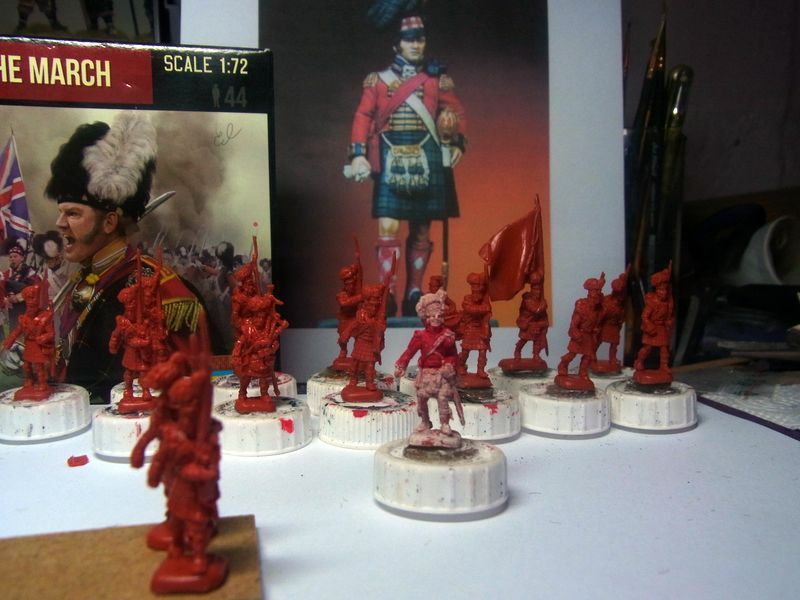 And I am very happy, as well that Paul takes the ring to paint the mother of all parade units the old Airfix Guards. So keep on the good work and post pics here to encourage all the other members here. I thought it best to share this with all you guys. I like to help but sometimes things do not turn out in a good way. 50 odd years old and they are KAPUT! Sorry Comrades. However this is Work In Progress ,but how can I progress from here? Easy I opened up other boxes and they are A OK! So I`ll paint a few samples up to get my eye in. 50 odd years old and they are KAPUT! what do you expect from today`s people over 50? 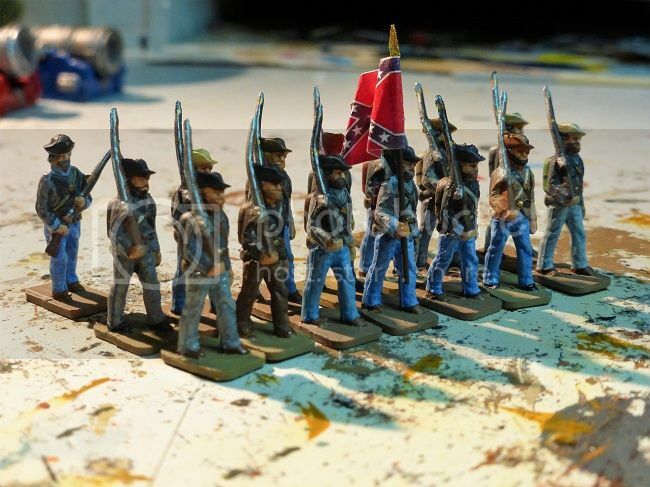 I have the same problem with my old ACW Sets. But I try to handle them very very careful and it works. 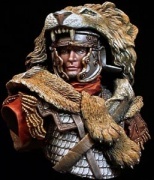 But I think the Guards Figures are much older. So I am relly happy that you found another set ready to paint! I think they used to mix the plastic with cement in the oldest Airfix guys. I am glad that is no longer done. BB could you just glue them marchers back together? Bluefalchion wrote: I think they used to mix the plastic with cement in the oldest Airfix guys. I am glad that is no longer done. BB could you just glue them marchers back together? I hear that Airfix made a "Chelsea Pensioner's Hospital" kit in the 1970s. Surely they could be sent there...?! Wiking wrote: what do you expect from today`s people over 50? Hi Guys,I checked out some very good figures today in relationship of fitness to set a pace for todays much newer younger model figures in the Parade,or if you wish to call a spade a spade like myself? 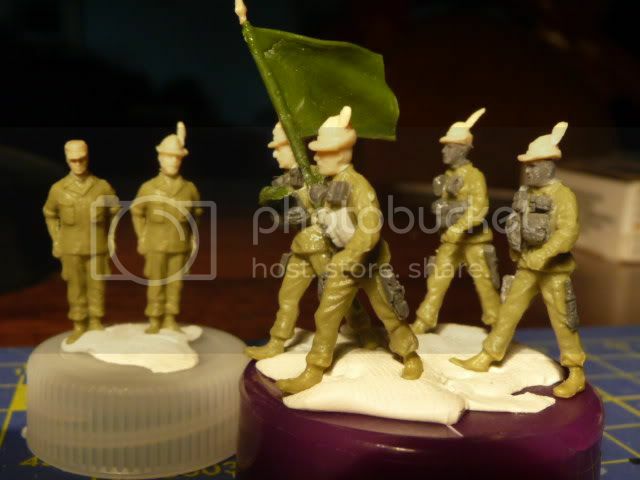 Toy Soldiers! With the advent of todays rubbery sets these will crumble very quickly when compared with the Senior Service AIRFIX Veterans of the 1960`s. Rubber and Starch mixes will Rot Quick and using oil based paints and varnishes will hasten their demise even quicker. Plastic due to releasing agents used in machines ,and because of ultraviolet light wavelengths of which there are many patterns,will eventually dwindle into old age ,( as we all do ),but for the most part are good for collectors and painters alike. The best way to test for plastic Fatigue is bend the figure platform a little,and if they twing back into place they are fine enough to paint. If the legs easily brake and crumble like dried up tooth paste they have the dreaded Fatigue!
" no fit toy figure suffered in any way shape or form during bb`s inspection, and those unfit for Muster were put out of their misery quick and duly assigned to the bin in bits and pieces! "Glue e`m back together, No Way!" All use the "good stuff" transported inside a plastic zip bag. The Highlanders from STRELETS are on the march. Konrad wrote: Count me in. HEH? Why do you already have them? Did I miss to see that they're already for sale?? ?